Someone posted this picture in FB and I was stunned to find that most of the kids in there were my friends from Sek Rendah Sultan Ibrahim (2), Pasir Mas.The picture was taken around 1973-74. 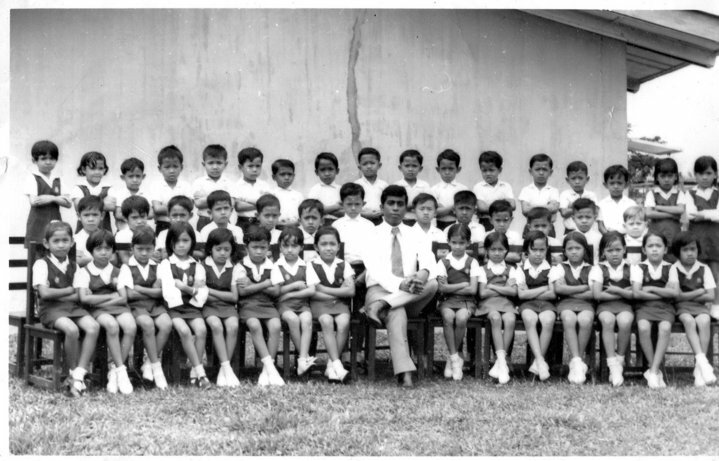 I guess it is a class picture from the school; ironically I could not find myself in that picture. I am very certain that I can identify most of them and they were my classmates but where was I ? maybe it was before I joined the class. I think they were from the batch one year older than me. During that time there was a program called “express class” introduced to give a chance for some kids to “skip a year” ( by doing 6 months year 3 and 6 months year 4)and took Penilaian Darjah Lima in the following year. I think in year 5 some of those kids were my classmates. But I like the picture because I want to show you the meanest teacher that I ever had—Mr Salim, that one sitting right in the middle of the picture ( I talked about him here and here). He had no reason to be so mean to the kampong kids in Kelantan who could not pronounce an English word like the Queen of England. It’s just not fair. I am not sure I like him much until this very day.